SmartDO 3.1 has great enhancement over its user interface. With its powerful and flexible programmable feature, release 3.1 provide even more user-friendly interface to perform the design optimization task. Control Panel acts as the the optimization process integrator. 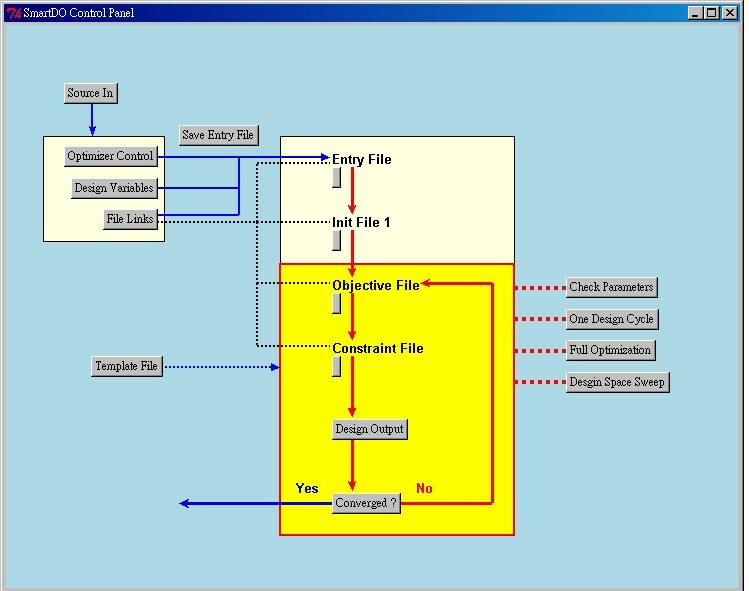 With the tasks and connections layout as graphical flowchart on the Control Panel, the user can easily understand and control the design optimization process. Also, all actions and settings are just few clicks away. The Control Panel can be used to overlook the layout of the design optimization process, set up the controlling parameters, integrate with the external programs, test the integrated engineering cycle, execute optimization and Review the optimization result. SmartScripting is a GUI for generating Tcl/Tk and SmartDO script automatically. 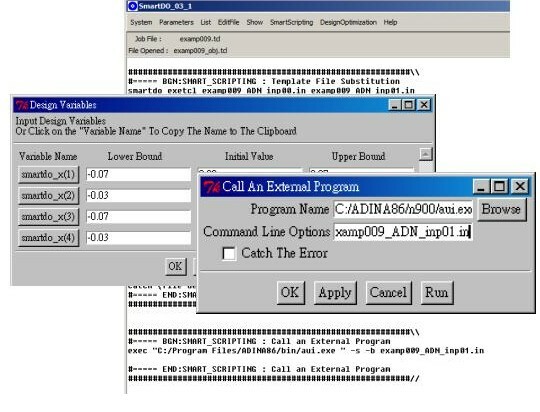 The user can access the programmable feature of SmartDO by answering questions in the dialog box, and SmartScripting will generate Tcl/Tk scripts accurately. With SmartScripting, programming with SmartDO is easy and efficient. SmartScripting now has many frequently used template built in, like substituting, calling an external program, deleting files, open/closing a file to read, searching for a string and react, retrieving values from a string, and more.